The Lower Modernisms – 006. Lomo Featured Project: Pann’s Coffee Shop. 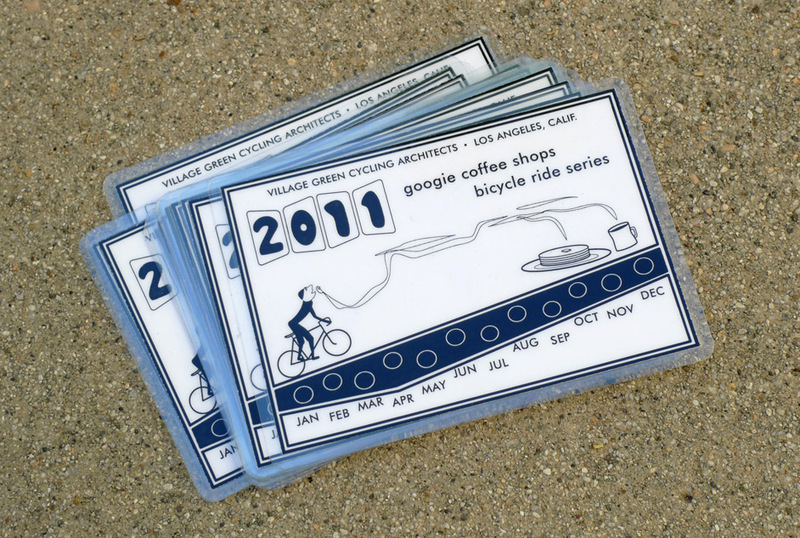 Introducing the 2011 Googie Coffee Shops Bicycle Ride Series. February 20, 2011 by James Black. 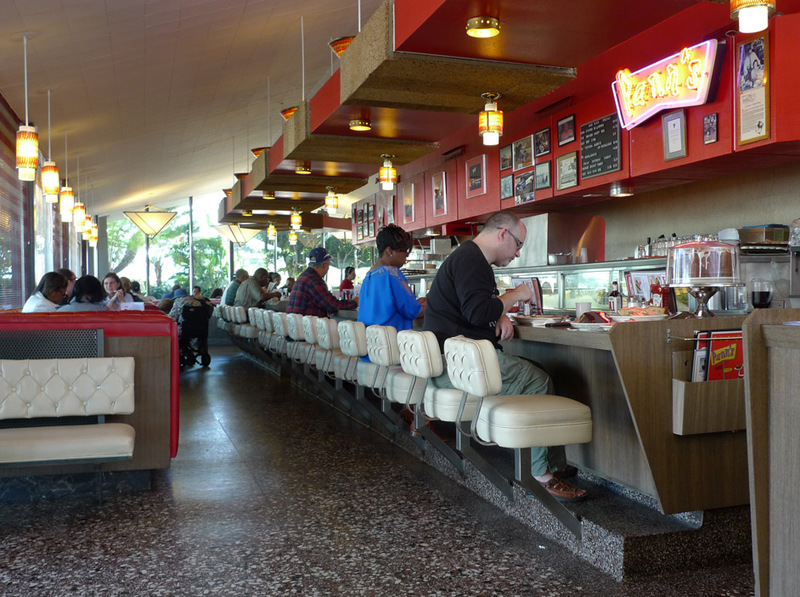 Our first ride destination, on January 22, 2011, was Pann’s, surely one of the finest extant Googie coffee shops. 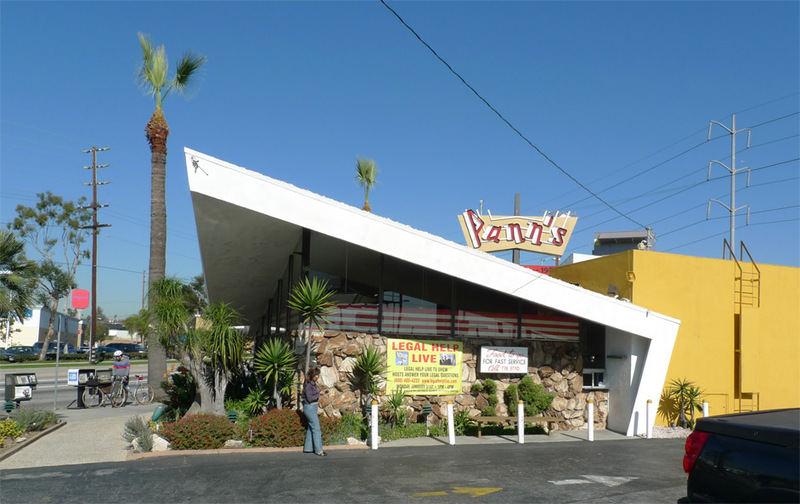 Pann’s was designed by the firm of Armét and Davis and opened in 1958. 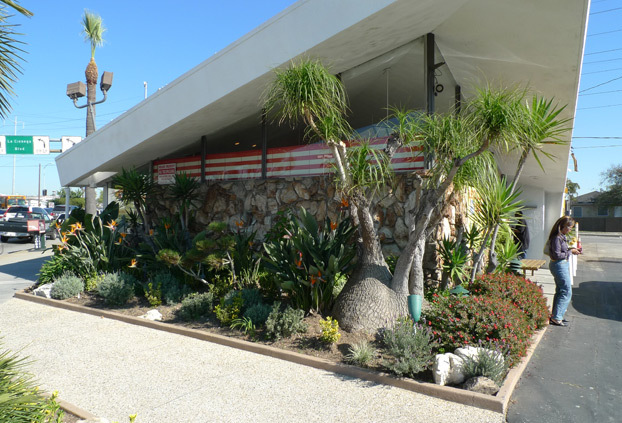 Pann’s occupies a triangular sliver of land at the busy intersection of La Cienega, La Tijera and Centinela south of the Baldwin Hills near the city of Inglewood. This difficult site works to Pann’s benefit, as the compression toward the sharp corner dramatizes the space and culminates strikingly in a point like the prow of a ship. The pylon sign, tilted at a jaunty angle, is a jumble of colors and shapes, extending up through a hole in the roof. The roof surface itself is decoratively topped with multicolored gravel – it is an additional façade. From the exterior, the dining room is expressed and distinguished from the kitchen area – where the back-of-house is a dumb stucco box painted in contrasting gold paint, the dining roof is enveloped in a folded plane that forms wall and roof, a shelter from the exterior environment of the street encompassing both the dining room and the planted garden areas outside the glass walls. The landscaping is the classic Googie palette of Dr. Seuss trees and dinosaur plants, bringing together the opposed worlds of humid tropics and dry desert in an assortment of ferns, palms and succulents, featuring most conspicuously a huge specimen of the bulbous-bottomed “elephant’s foot palm”. The landscaping is outlined by a low curb, framed by an angular walkway of river-rock finish concrete paving and the partial-height rock wall of the building. Like many contemporary coffee shops, the dining room is organized linearly – a main walkway is lined by banquettes and tables along the window side, and a bar with stools on the kitchen side. Barstools are cantilevered from a raised platform, the terrazzo surface of the floor smoothly coved to form this plinth. The space at Pann’s begins in an almost cavelike area inside the entry doors, with walls of stone wrapping around the south end of the building. The long line of the counter is tracked by the lowered soffit overhead, and then the space opens up and out to the high peaked roof at the north end, enclosed with glass that leads the eye out to the garden. The dramatic peak reminds one of Wright’s 1947 Unitarian church in Madison, Wisconsin. The concept of space is fluid, not confined; it has no visual end. Through the glass walls, it flows out and encompasses the street and the sidewalk; through the strategic placement of walls and curves, the end of the space is obscured. There are no boxed-in corners that stop the view; visually the space doesn’t appear to end as it curves around the end of the counter (108). 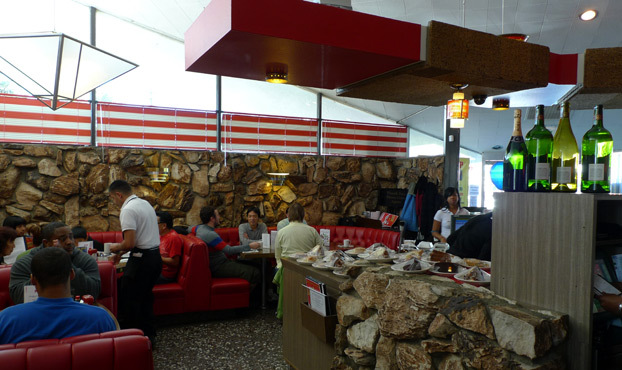 I consider Pann’s to be one of the most successful architectural designs in the Southland – when I’m feeling down in the dumps about the potential of architecture, I head to Pann’s to recharge my morale. In terms of achieving the goals of the Modern Movement, Pann’s is up there with anything – it’s functional, unique, site-specific, ahistorical in its look, transformative, playful, and it feels good to hang out there. I feel it should be obvious why I consider Pann’s to be too rigorous, too uncompromised, too legitimately Modernist to be really a manifestation of the Lower Modernisms that are the stated subject of the LoMos project. Rather, what Pann’s represents is the ideal to which the Lower Modernisms (but not the Legitimate Modernisms) aspired. Man, I wish I could have gone with you guys to this. If I’m LA sans bike when one of these is going on, can I borrow one from you? Hopefully I won’t end up having to go on the 80-miler. I love the photography here, too. This blog is super sweet. Thanks, Nate! I appreciate that. I would love to go on the next ride! Ps I’m writing this from a booth at pann’s. Btw, the light in here is amazing! When is the next Googie Ride, I don’t know where to look for it.